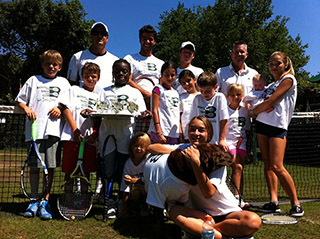 The Buckskill Junior Program is designed to accomodate total flexibility in your schedule. Our junior program comprises of a series of 1 1/2 hour clinics with four clinics scheduled per day, Monday through Friday. You may create your own schedule by choosing to come to any number or any combination of clinics (1 through 4) per day. 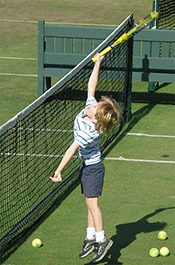 In this way you can schedule your child for a full day of tennis, i.e. 4 clinics from 9 a.m. to 4 p.m. with an hour for lunch; mornings only, i.e. 2 clinics from 9 a.m. to noon, with a lunch option from noon to 1p.m. ; a late start, i.e. 3 clinics from 10:30 a.m. to 4p.m. 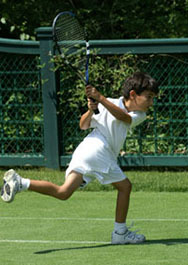 ; or schedule for an hour and a half clinic whenever you feel like it or any other combination that suits your child!! You may pay clinic by clinic or purchase a discounted clinic package (see below for details). 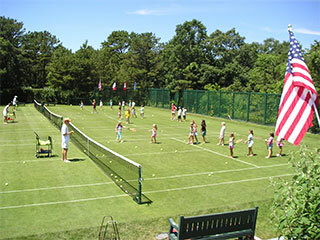 All instructional groups are organized by tennis ability (all ages and abilities are welcome!). 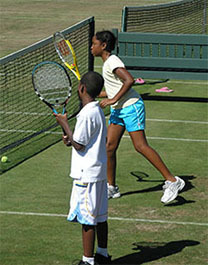 We stress the importance of enjoying the game of tennis while learning and continuing to improve! and continue through the summer, ending on Friday August 30th. 9:00 - 10:30 a.m. 10:30 - 12:00 a.m. 1:00 - 2:30 p.m. 2:30 - 4:00 p.m.
All Clinics run Monday through Friday. Our Spring schedule features after school clinics and weekend junior clinics at a pre-season discounted rate!